Easiest butternut squash chili for Monday, coming right up. Okay, easy in the form of chili. And good for us. Like super food for us! Or should I say… SOUPER good for us. Hearty, satisfying, this bowl is all the things. You are going to LOVE it. I really love having a WARM lunch option that only takes a few minutes to heat up during this busy season. Of course, there are so many other lunches that I love to eat – like my favorite egg salad, anything with crispy chickpeas, some sort of avocado toast and obviously, scrambled or fried eggs. But some days when I’m chilled to the bone I want soup! There are lots of soups that are reheat-able (it’s totally a word) and this one is fantastic. It has beans, butternut squash AND quinoa, so it’s basically a nutritional powerhouse. I would be very into it if you threw some sliced avocado, plain greek yogurt and maybe even some tortilla chips on top. Sidebar: this was a great day when I opened eight avocados that were all black inside. Yes I totally do the stem trick and it achieved nothing for me that day. Such a bummer! Anyhoo back to the butternut squash chili. As unappealing as it may look, it tastes great and will solve your lunchtime woes. This is not the first time I’ve made a chili with quinoa! Remember a few years ago when I made this white chicken chili? I say a few years as if it was, like, two years. It has actually been FIVE! I’m definitely the person who feels like 1998 was five years ago, so that’s a shocking surprise. But the thing is that you guys LOVE that chili. It’s still a huge favorite here on the blog, which makes me so happy. I just love using quinoa because it is super filling. Pinto beans are by far my bean of choice and, well… I don’t think anyone here is questioning my love of butternut squash. Oh oh oh and guess WHAT?! The entire thing starts with one caramelized onion. Oh yes it does. It’s a step that adds a delicious depth of flavor but if you’re in a rush, of course you could skip it or even throw in some sugar to caramelize it quickly. Try not to overcook the squash. You want it to just be bite-able. Can squash be al dente? Let’s say yes and then do that. This can be rather “mushy” as it sits because you have beans, squash and quinoa – none of which have a lot of chew. After a few days of leftovers, this may get a little soft so I suggest lots of crunch on top! You could even add roasted chickpeas ON it. Another option is to separate portions and cook some quinoa in it right before serving. I love how quinoa has a little POP of texture, but that disappears after it sits for a few days. If you do this, you’ll want to have some extra veggie stock on hand. And finally: repurpose it! This is amazing stuffed in sweet potatoes. I’m extra obsessed. 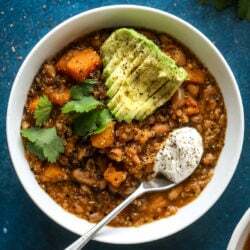 This butternut squash chili is super satisfying and delicious! It's made with pinto beans and quinoa, comes together quickly and is filling and perfect to reheat for lunches. Everything you want in a vegetarian chili! Heat a large pot over medium-low heat and add the olive oil. Add in the onion with the salt and pepper and stir. Cook the onion, stirring often, until it caramelizes, about 20 minutes (this should happen quickly since it's diced!). Add in the garlic and stir. Add in the cubed butternut squash along with the chili powder, cumin and paprika. Stir to combine it all. Add in the tomatoes, 3 cups of stock (if you want a thinner soup, you can add an additional cup - also if seems like you need more liquid!) and the beans (I like 2 cans, but you can add 1!) and bring the mixture to a boil. Cover, reduce to a simmer, and cook until the squash is just fork tender, about 10 to 15 minutes. While the squash is cooking, you can cook the quinoa! I would just follow the package directions, which usually call for quinoa to be cooked for about 15 minutes. Once the squash has softened, stir in the quinoa. Taste and add more salt and pepper if you need it. Simmer the chili for about 10 minutes to bring everything together. Serve it topped with avocado, plain greek yogurt and some fresh cilantro if you wish! The toppings MAKE this bowl, so don't leave them out! Now I just want someone to come make my a cozy bowl of this. Looks delicious! Have you tried this with sweet potato? I just did my grocery shopping and thought maybe I could make this tonight just swap veggies….thoughts? Looks soooooo good. I have a bag of frozen butternut squash, do you think that would work just as well? Yes, I have the same question about using frozen butternut squash. This looks sooo good! Made this tonight- SO easy and so damn good. Had jalapeño corn muffins too! This is amazing!! If I am going to eat healthy, it better be good. This had flavor, depth and with the condiments, I didn’t miss the meat. Thank you for making healthy taste good!